The playful approach to learning a new concept that kids usually take when playing a video game can be just the right jumping-off point for diving deeply into a topic. Games can’t do all the teaching, but can engage kids to start thinking. At least that’s how MIT’s Education Arcade and the Learning Games Network are approaching their new free game Quandary. The two groups designed the video game to teach ethics while aligning with Common Core State Standards in English Language Arts for third through eighth graders. Quandary approaches the broad topic of ethics by helping students understand how to take a different perspective and learn how to empathize. In the game, Earth residents have colonized the far away planet of Braxos. The player is the captain of the mission and has to make important decisions about survival in the new world that will affect her crew and the residents of Braxos. The game currently has three episodes that follow a similar pattern. The player learns a little about a problem on the planet through a comic strip narrative. He then must interview different characters and organize their statements into facts, solutions, and other opinions. After accurately categorizing various kinds of statements, the player can present characters with different solutions or facts to dig into the issues deeper, gathering more information. Through play, the issue becomes more complex and the game shifts. If the captain fails to thoroughly investigate the problem, he or she will miss valuable pieces of information. “Every time I play a fact, the value of each drops down, so I can only play them a limited number of times,” explained Peter Stidwill, executive producer of the Learning Games Network in an BrainPOP Educators webinar. “So I can’t play facts willy-nilly; I really have to think through what I’m going to do.” Players have to think critically about the right facts to elicit important information from different characters, some of which prove to be pretty stubborn. After the fact-finding stage, the player must make a recommendation to a council back on Earth and justify why he’s urging that course of action. “If I haven’t gone through the process of finding out information from the characters then I actually don’t have the information to hand,” Stidwill said. And that means fewer points. The player also has to predict how each character will react to the decision, further testing their ability to take perspectives and show empathy. Ultimately, the game will show the player the outcome their decision achieved and how it affected the colony. Osterweil is careful to say the game doesn’t teach ethics, per se. “We see games as an organized space for playful exploration and through the process people encounter and form new ideas and concepts, they begin to construct knowledge,” Osterweil said. “But I would argue that the beauty of the game is that it’s a free and voluntary space, the risk therefore is that the player might enjoy playing the game and walk away and never think about it again.” That’s why the discussion component is so important. The game developers tried to increase the player’s sense of agency by playing off a common childhood fantasy of traveling to another world where he or she is the boss. “We think that by projecting themselves as the Captain they’ll be more deeply engaged,” said Osterweil. Thus, they get the chance to be imaginative, trying out different choices and even replaying the game to see how different tactics affect their score. The Quandary developers encourage kids to play in pairs so they can discuss how and why they're making choices. What's more, a conversation with an adult after the child has played will offer more opportunities to make those ideas around perspective and empathy stick. “We’re not trying to make ethics fun, we’re trying to ask, where is the pleasure kids already get from these kinds of dilemmas and how do we capture it and maybe codify it in a game,” Osterweil said. It might seem strange that a video game could promote empathy given some research suggesting video game play can actually dull empathy because they take place in a simulated world, rather than the real one. But Quandary's developers don't see those critiques as applicable in their game. Instead, they see it as a tool that allows players to experience a diverse set of character viewpoints. "The game offers a unique decision-making mechanic, one where the choices and outcomes available to players are not a binary 'good or bad', and where there are no easy, right answers," said Stidwill. "It's designed to promote reflection and discussion - and from what we've seen, it does this really well." The two organizations have developed several tools for teachers to use if assigning the game in class, including an implementation video, game flow chart, and sample lesson plan. There’s also a mapping document showing how different parts of the game address Common Core standards. They’ve also tried to open up thinking around the game by providing a few deeper, discussion questions, like an exploration of what other options might have solved the dilemma besides the choices offered in the game. 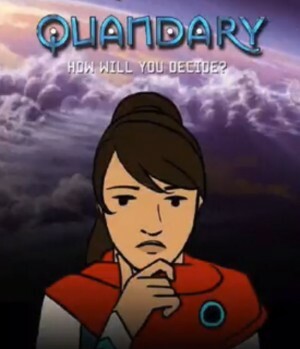 Quandary has a new iPhone and Android app that offers almost the same experience as the web-based game, with one exception. In the app, players can create their own character. Players who have created characters can enter them into a contest Learning Games Network is running until December 6th. The creator of the best character will win the opportunity to become a member of the design team working on the next episode of Quandary. Both the web-based and app version of the game are available for free.